Posted on 2/6/2009, 2:08 am, by Colin Charles, under General. I’ve never been much of a Japanophile, but the couple minutes or so that I saw Preetam demonstrate the use of the Furoshiki, I was hooked. Preetam did a lightning talk demo at BarcampBKK3, where he demoed how you could hold books in it. Later, Satoko (@31o5) mentioned that you could also hold bottles of wine, and more. Naturally, I was intrigued, so I hopped on and found a bunch of cool things you can do with it. For one, the Ministry of Environment in Japan has published a guide on how to make use of it. All the various different knots, and methods, for you to carry items of varying sizes, and volumes. Very useful. I also found it most interesting to note that there are stores that specialise in this – take a look at this post from Kyoto. Want to buy one? 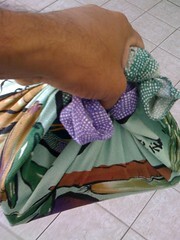 All hail Furoshiki.com. They seem to be about USD$12-$70, not including shipping and handling, depending on the styles available. Further links: a bit of history, how to gift wrap (video), usage etiquette, history, folding guides and more (very useful resource), a video of a store in Kyoto, and how to use it to carry your bento boxes. I have to admit, that Japanese culture and custom is starting to interest me these days. Seems like there’s a lot to learn, as there are things I’d consider innovative, that is part of daily Japanese life. I wonder if a book like Urawaza: Secret Everyday Tips and Tricks from Japan will help?